A free playable demo for "The Cursed Crusade" is now available for download from Xbox LIVE. The demo weighs in at roughly 670MB and should be available in all Xbox LIVE regions. Dash Text: It is a newly begun Fourth Crusade, and Denz and Esteban must quest across western Europe as soldiers seeking deliverance from a terrible curse that threatens to consume their immortal souls. Embark on a contentious quest for retribution in this 2-player co-operative adventure. Avail yourself of the powers of the Templar’s Curse at the high cost of your humanity. For more detailed information on The Cursed Crusade please visit the 360-HQ Xbox 360 Games Hub. 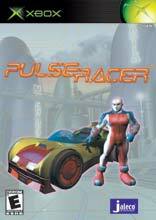 360-HQ Games Hub: The Cursed Crusade"
Pulse Racer is set in a dazzling future where players careen towards the clouds in sleek vehicles, using high-tech tools and their own life force, to gain an advantage over the competition. Racers..